Up until now, all we've seen of the Xperia i1 Honami from Sony is pretty much everything. From high res captures to alleged press images to specs, there's even a system dump that revealed a new camera UI for its 20MP shooter. 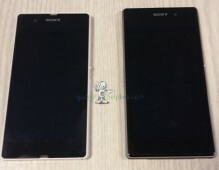 One thing we haven’t seen yet is it pictured next to the flagship it's set to succeed, the Sony Xperia Z. Judging by how similar the design strategy looks to be and seeing as how the Honami is set to also have a 5" 1080p display, it's a pretty safe bet that the devices should look very similar. 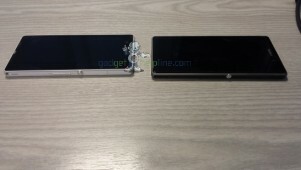 The first two shots indicate that the Honami is slightly longer and just a hair wider than the Xperia Z. Also included are some shots of the new camera UI. 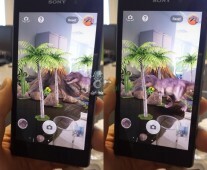 Although we've already seen this interface via the earlier leaked camera app, this time they're in English, so we get a better idea of what it is about. By all accounts, the Honami is expected to be revealed at Sony's dedicated press event at IFA in Berlin on September 4. Be sure to check back with us then for full coverage! What are you smoking dude? give us some! HAHAHA you are one delusional samsung fanboy. hello if I' tell the truth,and the HTC One och Sony Xperia Z is, I've been fascinated by.